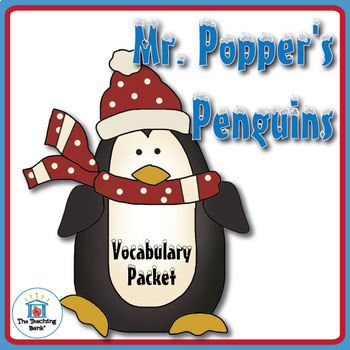 Mr. Popper's Penguins Vocabulary Packet is a vocabulary packet to be used with Mr. Popper's Penguins by Richard and Florence Atwater. •Vocabulary bookmark with 35 vocabulary words listed. •Dictionary definition activity sheet for the 35 words. •An after the book vocabulary quiz. ♦Please note this packet contains vocabulary activities ONLY. You can find all of these activities in both printable and Google Drive compatible formats along with comprehension, writing activities, assessments, teacher plans, and Common Core Standard alignment Mr. Popper's Penguins Novel Study Book Unit that is also available here in my store. If you are looking for more a more extensive unit please check it out! ★If you have previously purchased the larger teaching unit this is a duplicate to what you already own. You can also find this Vocabulary Packet bundled with an Assessment Packet at: Mr. Popper's Penguins Vocabulary and Assessment Packet. Buy together and save!